The first gig for six months, and in retrospect the first good one I did. I was finally approaching the sound I wanted, and the set consisted of initial versions of all the tracks from the 'Problems With Perspective' EP. 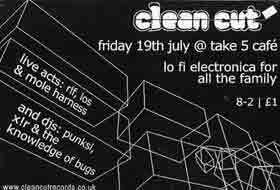 On the closing track I also played live guitar for the first time - the early gigs had all been performed on the sampler only.